On May 23rd mid way through what might yet prove to be the best week of summer 2012, Heydi Foster, Penny More and Nora O'Connor took the Intercity to Castlebar, Co. Mayo. The trip was conceived in April during a visit to Exchange House by Carmel and Josephine of Mayo Women’s Support Service (MWSS). The idea of a Round Table Conversation / Discussion was nurtured, dates exchanged and the day dawned. could the pattern / implications of refuge use amongst Traveller women inform openness within the community to own the problem of Domestic Violence? could this be supported by an ethos of non-violence within the community and a willingness to address some of the issues from within? 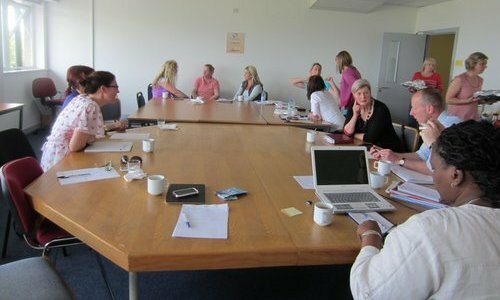 what might progress ‘Best Practice in working with Travellers experiencing Domestic Violence’ to another level? There was agreement on the need to involve Traveller men. It was suggested that this might be approached through an interest / hobby club similar to Exchange House Youth Team Leader, William McDonagh's history group. Over time such a club might evolve into a discussion forum. The primary health care workers expressed concern for their personal safety especially when addressing domestic violence or child protection within the community in which they live. It was agreed that their concern may have implications for service delivery; primary health care workers provide a link into the community and are best placed to promote change from within. Participants agreed that a lack of cultural awareness within the legal system, presented additional barriers for Travellers accessing court orders. The exchanges were frank and open, the meeting concluded with a commitment to meeting in September to form a plan of action for a co-ordinated community response. Services including CAMHS will be invited.